Welcome to "The Gods Are Bored!" It's me, Anne Johnson, sitting here awaiting a Nor'Easter. I've got my bread, my milk, my candles, and my firewood. It's all good. I also have a house guest, at least for one night. Let me tell you all about it. Some of you old-timers might remember that I had a parrot named Decibel. Poor Decibel keeled over from heart disease a little more than a year ago, and I buried her near a pond that lies just behind my house. With a storm approaching, I thought I would go by Decibel's grave and spend a bit of time before it starts snowing. Decibel's grave overlooks the pond (it's a smallish number, home to some snapping turtles and a fractious mallard or two). As I stood there I looked toward the water, and I saw a man standing on the bank. At first I thought it was my friend the Monkey Man, done up in his Walt Whitman attire. But the Monkey Man never grows his beard as wild as this guy's was. Doing Walt Whitman impersonations is popular around here, so I guessed I was looking at one of those sorts of people. I'm softhearted for reenactors. You see truckloads of them in Philadelphia. So I climbed down the bank and hailed the guy. "You called me," he said. And damn, he was the best all-time Walt Whitman reenactor I ever, ever saw! He looked just like -- I mean just like -- the last photo taken of him. This is the guy. Except it really is the guy. I've watched a little bit of Doctor Who, enough to know that he has some kind of time machine and he changes faces conveniently every few years. Must say I felt a little bit like I'd stumbled into an episode. Walt Whitman was standing there, along the pond, staring at me. "I heard you calling," he said, "but I'm a trifle lost. Is this Camden?" "Camden's about three miles to the east," I said. I was genteel enough not to add, and your mausoleum is right on the edge, I go there all the time. He took off his hat like a gentleman, extended his hand, and said, "I'm Walt Whitman. Maybe you have heard of my poem, 'O Captain My Captain.'" And this is how I knew it was really Walt Whitman. You say that to a reenactor, you get a knowing nod. You say that to Walt Whitman and you get a hungry look, like, "Has this person bought my book?" Then I decided against it. No predicting how an old dude is going to react when you tell him a major steel bridge linking New Jersey and Pennsylvania across the Delaware River is named after him. He said, "I heard you calling, but I didn't know you would be a reader." Except I didn't call him. I was just standing by Decibel's grave, looking for him under my boot-soles. "What can I do for you, Miss ... Miss ..."
"How can I help you, Anne Johnson? You can see, I suppose, that I'm not in a shape to help anyone with physical labor." Okay, now I was skeeved. But I soldiered on. "I'm not sure why I hailed you, exactly," I said. "It might be because of your great, unbridled optimism for this land and its people." He shook his white locks at the runaway sun. "I lost much of that optimism during the War." "I know," I said. "Somehow, some way, I want you to keep America out of another civil war. We need to hear America singing Her great, varied carols. We need to celebrate the body electric. We need to believe that every hour of the light and the dark is a miracle." "By my soul, you really know my writing," he said. "Everyone knows your writing. You've wandered into the future, Mr. Whitman." He looked stricken. "Am I a ghost?" "You sure don't look like one." He seemed doubtful, then mournful. "How did I die?" he asked. "You aren't dead," I said. "You are as alive as Sophocles, as Shakespeare. Name ten famous poets of your time, and I can honestly promise you that you are more famous than any of them. Don't dwell on death." I started steering him toward Chateau Johnson. "Here now. Come home with me. I'll make you some dinner and take you home in the morning. Please tell me you have your house key." He fumbled in the pocket of his ragged great coat and produced a key. It perked him up. I'm so forgetful," he said. "It's good to have this." Damn right, I thought. Because I have no idea how I'd get you in that museum otherwise. Well, reader, there you have it. 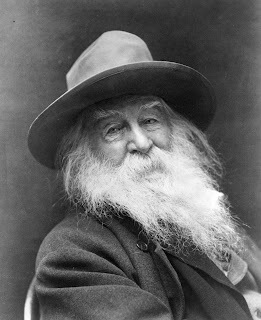 Walt Whitman is up in my book room, holding two separate editions of Leaves of Grass in his hands and staring at one, then the other. Wait until he reads the learned analysis in the front of the paperback! It will go right to his head. At the height of the Nor'Easter, I'll use the old Flexible Flyer to pull Walt Whitman into Camden. I'll take him to his home, which is right across the street from an incarceration center. Then I will call on him, frequently. We'll walk together. Maybe he has some words for us in these dark and dreadful times. What a fortuitous meeting, Anne! See if you can get hold of Woody Guthrie next! Anne, you have spammers, in case you hadn't noticed. I hope Mr Whitman isn't too undone by the future shock. Thank you for taking him in and giving him a warm meal. I don't know how those spammers arrived. I haven't changed my security settings. Ick. Out of the cradle, endlessly rocking . . .
Lucky thing, I envy you! What a great experience. I wish one or two of my favorite authors (Agatha Christie, Emily Dickinson, Edgar Allen Poe, to name a few) would show up around here, but I guess that's too much to expect. On second thought, I think I'd rather Poe NOT show up, unless he brings The Raven and is in a good mood. I'd love to have H. Allan Smith come visit me..